Each of our 3 chalets has an open plan living room/kitchen, 2 bedrooms and a bathroom with shower, wash basin and toilet. (double bed and bunk beds). 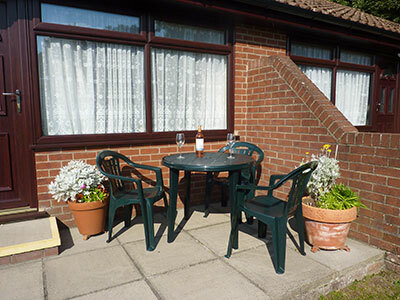 Chalets 2 & 3 sleeps 3 people in 2 bedrooms (double bed and single bed). The living room has a flat screen TV and DVD player. All rooms have electric heaters. Occupancy is from 2pm on the day of arrival until 10am on the day of departure. Normally bookings are from Friday to Friday but short breaks will be accepted subject to accommodation being available. Bedsheets, duvets, pillow cases and tea towels are provided. We are sorry but we are unable to accept pets. If you're looking for a peaceful holiday in a beautiful countryside setting, look no further! All prices include VAT. Parking space for 1 car only.